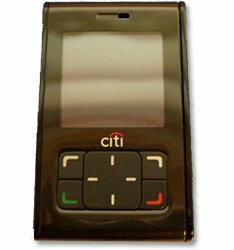 It has been rumored that the Citigroup organization has an NFC mobile phone under development that it plans to brand with the Citi logo. The phone will utilize an NFC payment application developed by Citi on the handsets, according to a report filed with the U.S. Federal Communications Commission. The report, submitted in March, clearly shows the Citi logo on the front of the tiny handset. The bank last year held what it later called a successful Near Field Communication test that involved storing a MasterCard Worldwide PayPass application on phones made by Nokia for subscribers of large U.S. mobile operator AT&T. But the branded phone that has been tested to meet FCC rules for its NFC features appears to be targeted at the U.S. market. It is a GSM handset complying with frequencies used by mobile operators there. The phone is small and light, leading one observer to speculate Citi plans to issue the phone at little or no cost to customers at all.